Oration delivered in Collinstown, Co. Westmeath on Sunday 27th May 2018 for the 135th Anniversary of the death of Michael Fagan, Irish National Invincible. Organised by Michael Fagan Society & Spirit of Irish Freedom Society. Today, we gather to pay tribute to the memory of Michael Fagan, a great republican and member of the Irish National Invincibles who gave his life for the cause of Irish freedom 135 years ago. It is appropriate that the people of Collinstown keep the memory of their patriotic native son alive, not only for his heroic example in life, but also to remember the important contribution to Irish republicanism of the group he was a member of: The Invincibles. Fagan and four members of the Invincibles took part in the assassinations of the Chief Secretary of Ireland, Frederick Cavendish, and the Under-Secretary, Thomas Henry Burke, two officials of the British administration in Ireland. These assassinations took place in the Phoenix Park, on May 6th, 1882. I originally wrote this piece in 2016, at that time Tony Taylor was interned for only 7 months, it is scandalous that two years later the contents of this article has not much changed, I have updated this article to reflect today’s situation. 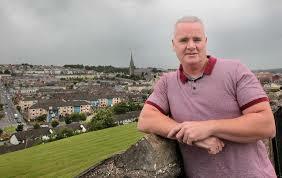 Tony Taylor, a Derry Republican has now been interned for over two years. Tony is a normal family man with a wife, children and responsibilities just like everyone else, he has been interned at the behest of the British Secretary of State in Ireland and has no charge against him, he has no case to answer and he has no trial to face. So why exactly is Tony Taylor in Jail? Why was he taken from his home and placed indefinitely in a prison cell? He certainly doesn’t know why nor does his family or lawyers; his predicament can be summed up with only one word - Internment!